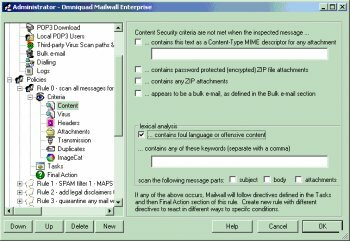 Mailwall removes all types of e-mail threats. It intercepts all e-mail messages on your network, disassembles them, and looks for undesired/illicit content and threats in your e-mail: SPAM exploits, macro viruses, and malicious HTML code. All policies are rules based - you can automatically filter, delete, or quarantine suspicious messages. Works with all mail servers and does not require changes in setup for your existing e-mail users.